Good evening! I hope this post finds you all quite well! Anywho, this is a little random, but today I acquired a new friend! Oh, look, there she is!! She was sort of an impulse buy (thanks to Virginia Dyer for the peer pressure), but I’m glad I got her because she’s so cute and sweet. 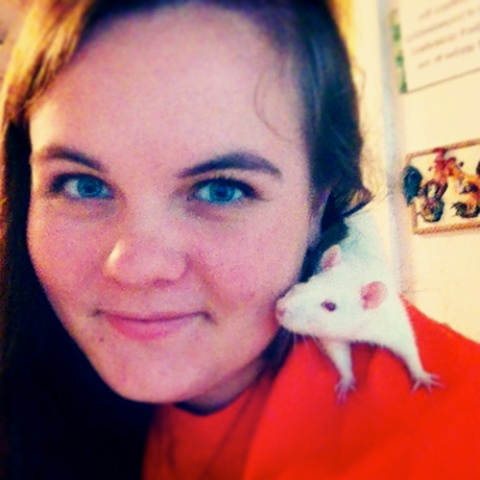 Plus, she gets along great with my other two rats (for now)! You might be wondering why in the world I would decide to purchase a rat out of the blue. Wwwwwell, the main reason is because she sort of reminds me of a character from my series (just go with it). The girl in the series, Cassandra “Cassie” Webb, has white hair and pink eyes just like this little cutie. So, naturally, I named her Cassie. I’m going with the story that she’s my graduation present because guess what? By the end of this week I’m going to be a high school graduate. Though, I still haven’t truly accepted it. At this point it’s kind of like *shrugs* Yeah, I’m graduating. People do it all the time. BUT THIS TIME IT’S MEEEEEE!!! SOooooOOoo. Back to book stuff. I thought I might as well answer a question today, just because I can’t think of anything else to blog about. Here it goes. Question: What led you to begin writing Mark of the Corripian? My Answer: I began the story because I was bored, honestly. I was supposed to be writing a research paper on polio and something else, and I decided to begin a little story while I was taking a break from research paper writing. The story was a complete mess at that point. It was told solely in Zenia’s point of view, though in diary entries. (It’s embarrassing to even speak about.) The main plot revolved around Zenia being placed into witness protection, which has carried over to the final version. But pretty much everything else has changed. Anywho, back to my reason for writing it. I’ve never been very good at expressing my thoughts and feelings in spoken words. If you know me very well, you can probably understand what I’m thinking/feeling by the expression on my face, but a complete stranger would most likely not know how to take it. When I was younger, I enjoyed making up short stories about animals, mostly, and so I guess I’ve always loved storytelling, though I had never put forth the effort to complete a full-length book. MotC was my first shot at a real story with likable characters and an intricate plot. Though, if you know me, you know I’m not good at just doing the bare minimum…I have to go all out and do my best possible work. Which means one book turned into a series of four (possibly six-seven) books that have all been thoroughly planned out. And through this whole process, I’ve found a way to express myself, as cheesy as that sounds. I’ve found friends within my characters, and I’ve been able to use this as a stress-reliever. I write because it calms me and helps me clear my mind. The day that changes–the day that I write because I HAVE to, and not because I WANT to–is the day I will stop writing. I pray that that day will not come, and I thank God for blessing me with this talent in the first place. Without Him, I would not be writing at all. Anyways, I hope I answered that question. And I hope you all have a wonderful night and a wonderful rest of the week! Welcome to Alabama, folks. (Okay, that was a minor exaggeration, but sometimes it feels this way!) It snowed pretty steadily for about half an hour, but it’s stopped now, and the snow is already melting. It was rather short lived, but it was fun while it lasted! Soooo. On to the question of the day!! Many different people have asked me this question over the months, so I thought I might as well answer it on here in case anyone else was wondering. Question: Are any of the characters in your book based on real people? My Answer: Yes and No. But mostly yes! This is a really fun question to answer, but at the same time difficult. There are a few characters that are literally based on my friends–personality, features, the works. And then some of the characters have a trait or two picked out from people I know. It’s also really helpful for me to use people I know as characters because I already know them. I don’t have to guess at how they’re feeling or what they would do in a certain situation (though, if I have my doubts, I can always ask!). But at the same time, I enjoy creating totally new characters! Aside from that, there are three or four more characters based on people I know in the following novels. Now, I also create characters who remind me of my friends and family, but don’t specifically plan on doing it; it just…happens. I usually realize later on that a certain character reminds me of someone. For instance, when my mother began reading my book (which wasn’t until after I began the second version), she pointed out that Xavier reminded her of me. I was like, NO WAY!!! It was the first time anyone had mentioned it, and I’d never really thought about it before then. I think after she said it, though, I got really into it, and kind of blew it up more. It was nice to have a character that I could relate to and that I didn’t have to think too hard when writing about. Until the book actually comes out, I won’t really go into detail about which character resembles whom. Though, I hope my answer was sufficient for today! 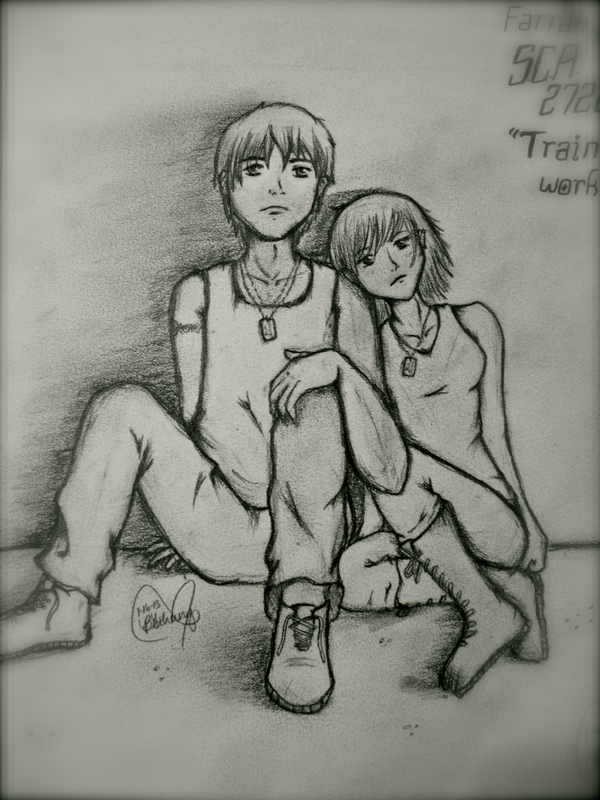 On a slightly random note, I drew a picture of two of my characters yesterday, and I thought I’d share it with you. So, here it is! All righty, folks, that’s it for tonight. Have a safe, blessed week. And watch out for that fluffy, cold, white stuff falling from the sky! I hope you have all had a wonderful day. I’m super excited right now because tomorrow is Friday, and Friday is one of my FAVORITE days ever. Question: How much have the characters changed from when they were first created? Wasn’t that short answer informative? I thought it was nicely worded. Now onto the detailed answer. If you read the last blog post, you know that when I began writing MotC, I had no clear goal in mind; I was just writing for the fun of it. Because of this, I felt no reason to really delve into the minds of the characters to figure out who they really were because, well, that took time and energy. And all I wanted when I began this story was some way to spend my free time doing something enjoyable. Though, as I moved along, it was only enjoyable if I had an intricate plot with likable, believable characters whom I knew as well as I knew myself. As for Xavier, the male protagonist, so many things have happened. First off, his memory loss actually wasn’t in the original version of the story (but is an important part now). He’s also become a main character, which is probably the biggest change. His personality has pretty much stayed the same, though: cocky, oftentimes sarcastic, and a loner. There have been many changes in the other characters, as well. For instance, two characters, Brent and April Colt, used to be very prevalent figures in the story, but now their importance has withered. I’ve created more characters since the creation of the story, and these characters have turned out to be far more important than the former characters. Thanks for the wonderful question, Virginia! I hope you all have a great night, a fabulous Friday, and a safe weekend! I hope you all had a wonderful Christmas. One of the great parts of my Christmas was the fact that I had finally finished reading through my manuscript!! I finished it on Christmas Eve, and it gave me such a delightful feeling of happiness. (: And it’s funny because I’m fairly certain this was the first time I have read my story through from beginning to end since I finished writing it. Crazy stuff. Question: When did you begin writing your first book, Mark of the Corripian? Answer: As usual, I will give a short answer and a more detailed answer. So, here is the short answer: March 29, 2011 and November 19, 2011. At this point you’re probably thinking I’m very confused because I just gave you two different dates, and there can only be one true date in which I began writing my book… Well, you’re right. But, that’s not exactly how I see it. Because in March I was merely messing around on the computer out of pure boredom (I was actually supposed to be typing up my research paper), and a story began to form. At that point, though, my characters really didn’t have personalities; they only had names. I had a storyline, but really no plot, no reason for writing. I just wrote a bunch of stuff that kept me entertained. I was also writing for a few of my friends, who love to read. I would give them a few pages of my story as I wrote, and they would read it and tell me how much they liked it. Nothing serious. And actually, before this point, I was never into writing. I had never attempted to write a manuscript (nor did I even really know what the term “manuscript” really meant), and I had no idea how to formulate a proper storyline with an interesting plot and memorable characters. But as I continued writing, I realized that I actually enjoyed it and I decided that I WAS going to finish this idea. However long it would take me. Now, onto November. Nearly eight months later, I decided that I was going to get serious. I scrapped EVERYTHING. Literally. I went back to the story, read a chapter, deleted the whole thing, wrote something different, then continued on. To help you to understand what a big change I made, I will say that the original version was in the POV of Zenia Curser and ONLY Zenia Curser. Xavier was in the story, but he was more of a supporting character. It’s crazy for me to even think about a time when Xavier was not a protagonist because his part is so important now. Anywho, I had to write in his chapters, which I found to be even easier than writing Zenia’s because it is far easier for me to relate to him. I began to develop an intricate plot (at times it seems almost too intricate…) and began to truly give my characters personalities and, essentially, meanings. I began doing research on different subjects so that the story would be more believable. I went all out. For instance, Xavier has a motorcycle in the story and I’d never actually been on one, so I decided to take a ride with a family friend (so fun!). Aside from that, I started boxing in order to understand a little better about combat situations (though it turns out I prefer to hit the speed bag versus an actual person), and I’ve asked a surgeon what he would do in certain circumstances in which a person was injured a certain way (asking a real live person is SO much more viable than using the internet). I hope you all enjoyed the post and have a wonderful week. Oh! And a great New Year!! I love words… So much. Got it at Books A Million–one of my favorite stores! Good evening! I hope this post finds you all well. Anywho, it’s been a while since I last blogged. As it turns out, I haven’t had much time to do anything lately. Though, today I will try to update you on bookly things. First off, my book has been going through copyediting this month, which covers grammatical and structural errors. Though, next month will mark the beginning of conceptual editing, when I will actually be working with an editor to make the story the best it can be (Eep!). It’s extremely sad how long it’s taking me to read through my own manuscript. What normally takes me two to five day to finish (this even includes editing, commenting, etc.) is taking me nearly one month to finish. Crazy stuff, guys. Alrighty. Now for a question from my dear FCP, Jacquelyn Hovey! Question: How did you come up with your interesting character names? My Answer: Okay, here’s the short answer: Latin, the Bible, and randomness. So, I took two years of Latin (Sophomore and Junior year) and absolutely loved it. Not necessarily for translating or even for structuring my own sentences, but for the vocabulary. If you’ve ever studied Latin, or just taken a peek at the language, you can probably figure out that so many English (and many other languages) words have Latin roots. That part fascinated me as well because I loved to learn a new Latin word, then figure out whether or not there were any English words that came from it. Quite enjoyable, indeed. Bouncing off of that, I use Latin words for many of my character names. For instance, the two main characters’ last names have Latin bases: Zenia Curser (curro, currere, cucurri, cursus–meaning to run over, traverse) and Xavier Patrocinor (patrocinium–patronage, protection). Now, I don’t choose these names randomly–they each mean something. Zenia’s last name describes her Ability: she can run at incredible speeds without tiring. Xavier’s last name describes what he must become in MotC: Zenia’s protector. The last place I go to find names is my own randomness. Sometimes I come up with a character that just doesn’t fit any name I find, so I simply create my own or use a random word. (Even though I say I come up with the names, I’m sure they are owned by some random person over yonder on the other side of the world or something…) For example, in MotC, there are Thalion, Rune, Relik, and Mirus, to name a few. Most Relatable Character… For Me, At Least! First off, today’s my birthday!! I have been waiting for this day for so many years… I am officially old enough to order merchandise off of the commercials on TV!! YES!! So, that was completely random. Though, on that random note, I will tell you briefly how my week has gone. First off, my puppy has been monopolizing my time, making it rather difficult to do anything other than care for him. And because of this, while I was out of the house (with him) on Thursday, I managed to misplace my printed-out manuscript. Talk about utter distress. I thought I was going to die. 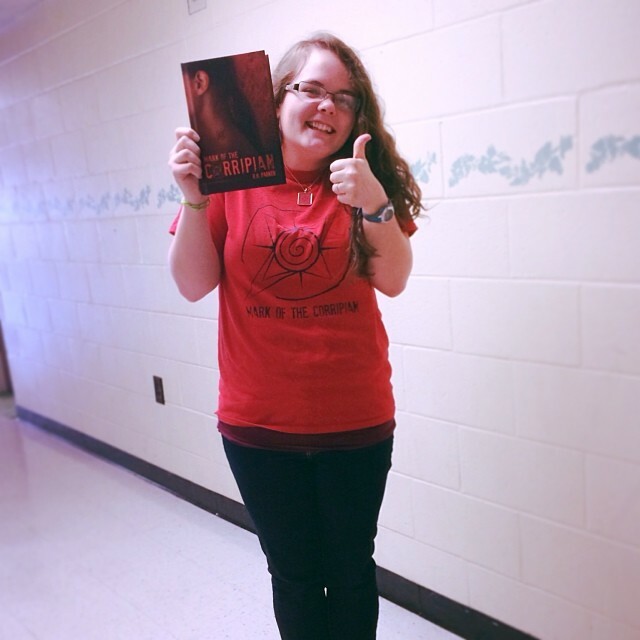 Now, on to the next part of my blog: Today I am going to answer a question from a fan who I am also able to call a very good friend, Sarah Kathryn Eubanks!! Question: Who is the character you feel you can most relate to? My Answer: This requires another brief character description!! Yippee!! Though, if you don’t want to read an entire character description, I will give you the quick answer: Xavier Patrocinor. All right, for those of you who want to know who Xavier is, stick around!! Xavier Ace Patrocinor was born in Kedesh, the western country on Macathia. He is twenty-one when the story begins, he is working at a government agency in Solum, and his Ability allows him to sense and control another person’s feeling/emotions. Unfortunately, I cannot tell you too much about Xavier because parts of his past are mysteries since he has lost two years of his memory. Anyways, you are probably wondering why I can relate to him. I shall now tell you. I hope that answered your question, Sarah (and thanks so much for asking)!!! I hope all of you have a great week! Stay safe!